"best of scottish coast & country"
Originally an old net store, for the once thriving fishing village, this self-catering holiday accommodation has been fully restored to a high standard. The open plan design, which has one en-suite bedroom, is ideally suited to a couple looking for a peaceful getaway at an affordable price or a short break by the sea. Gardenstown, locally known as Gamrie, was built into the old red sandstone cliffs. This traditional fishing village has much to explore - walks, heritage, arts and crafts, to name but a few. Together with the adjacent villages of Crovie and Pennan, it has proved to be a sought after film and TV location due to it’s natural beauty and heritage. It is also in close proximity to a number of great visitor attractions, golf clubs, whisky trail and much more. The village itself has a pub, shop, restaurant and art/craft gallery with tearoom. For those who want to stay in touch with the outside - free WIFI is available in the cottage. Many visitors return to the village year after year to experience the wonderful sunsets, friendly local community and little peace away from a mad, mad, world! 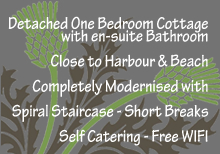 Harbour Cottage Gardenstown, offers the best of North East Scotland’s coast and country. Situated on the Moray Firth coastline, it boasts amazing views out to sea from the delightful harbour and beach. You may catch a glimpse of the dolphins, that often swim in the bay, being just one species of the abundance of wildlife the area is inhabited by. 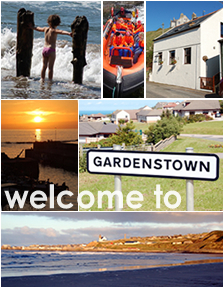 in gardenstown offering the best of scotland's coast & country"